My husband, three boys, and I were pretty excited about kicking off the Fall season out at a farm. It sounded like such a classic, picture-perfect way to start autumn. Plus we’d never been in a corn maze before. How cool! 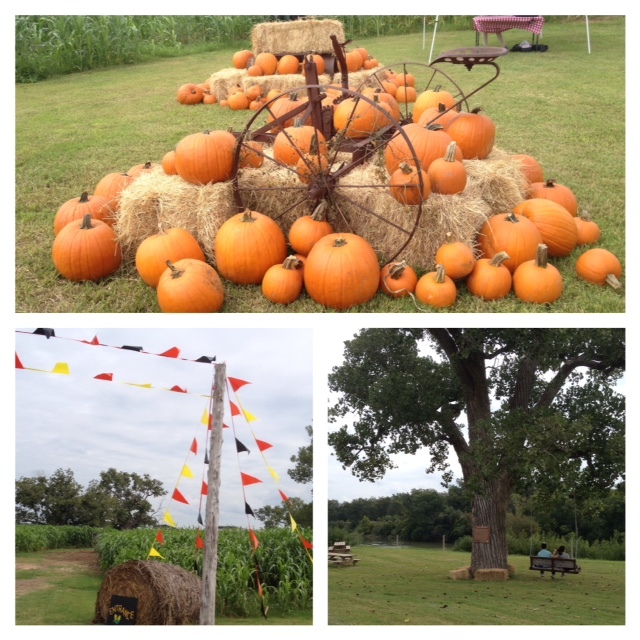 And as much as we thought we’d love it, Barton Hill Farms actually exceeded our expectations! Barton Hill Farms is on a very pretty, expansive landscape adjacent to the Colorado River, where plenty of folks were out kayaking on Saturday. At the farm, visitors were relaxing on blankets and lounging in the huge tree swings hanging from the enormous 100 year old cottonwood trees. 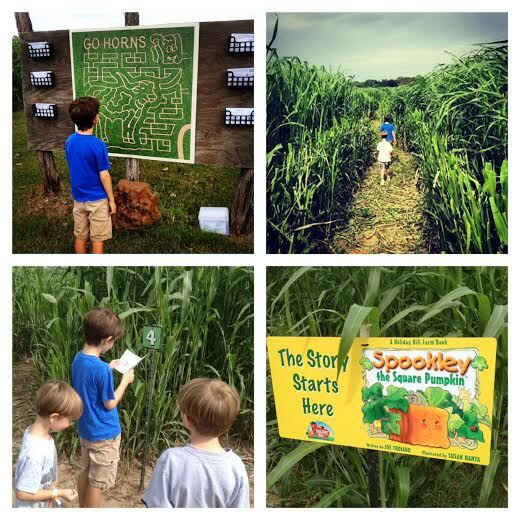 Our plan was to head straight for the giant “Go Horns” corn maze that we had been excited about. But plans changed the moment we saw the giant jumping pillow. We saw both kids and parents alike bouncing and squealing, and we just had to try it right away. The jumping pillow is like the bottom of a bouncy house without the sides. Bouncing on this open-air pillow was just unique enough that it gave this simply activity a fun new twist. Following the jumping pillow, my 6 year old insisted that it was time to tackle the huge corn maze. At the entrance to the maze, you can choose from a variety of half-page sheets with trivia questions that help guide you through the maze. Trivia themes varied from sports, to history to Halloween facts, etc. We picked a card and entered the maze. Every time we came to a numbered sign in the maze, we would read our cards and answer the question for directions on which way to turn. The kids really enjoyed the trivia aspect to this challenge, and the boys just loved the maze experience! It took us about 20 min. or so to get through it, and there was never a fear of getting lost within it. In addition to the big Go Horns maze, there is also a mini, storybook-themed corn maze for little kids. Beyond the corn maze, there were also plenty of extra activities to keep the kids entertained. My boys really loved seeing the animals on the farm. 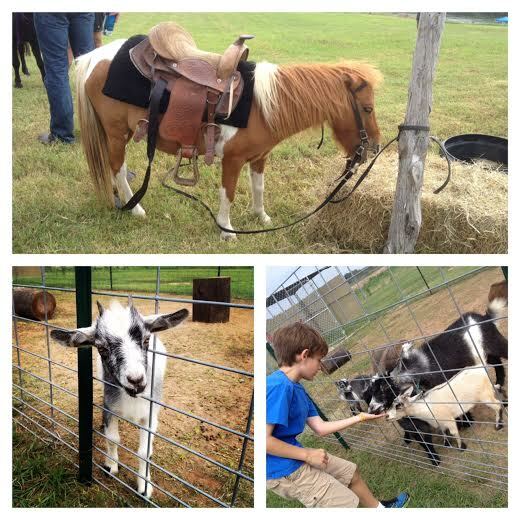 There were pony rides offered as well as lots of adorable baby goats to feed. 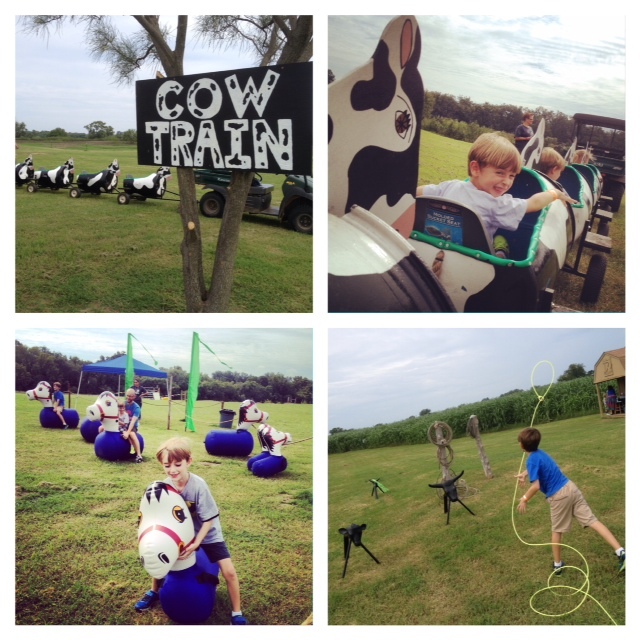 There was a cute, bumpy cow-themed barrel train ride that my youngest just loved. 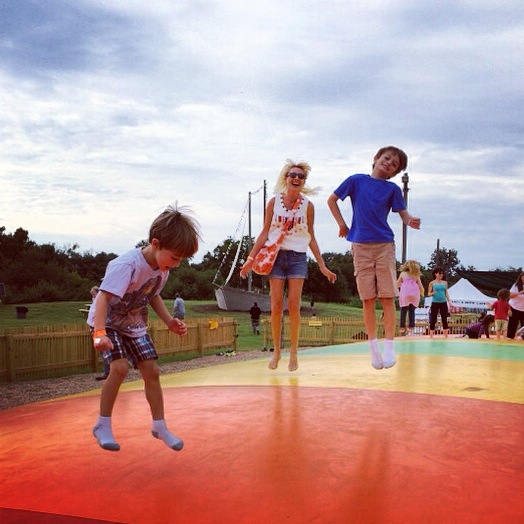 My boys also loved the Pony Hops where they bounced and raced around on big inflatable ponies. Kids can try their hand at steer dummy roping or race tricycles around a track. There’s also face painting and live country music to enjoy. 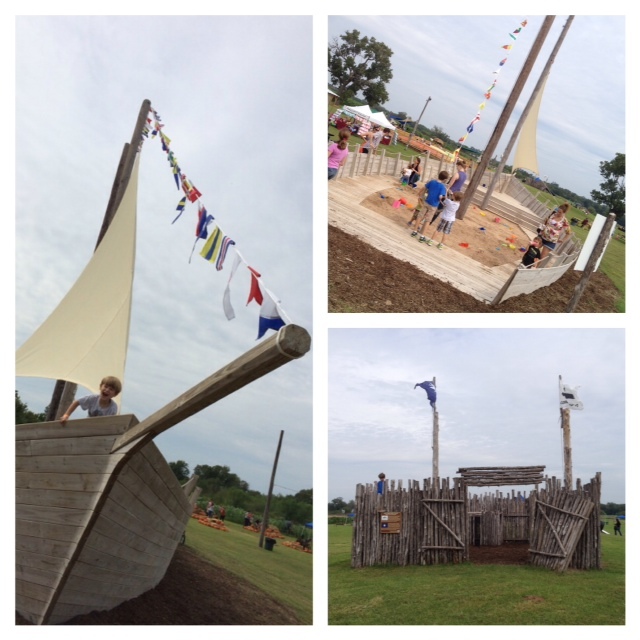 Also, Barton Hill Farms has a fifty-foot replica of an early Texas ship that doubled as a sand box that kids could climb on and pretend to sail. There was also a replica an 1800s era Texas Fort for children and adults to play in. Of course there were pumpkins to purchase, which kids could paint on site or take home. Overall, we spent about 3 hours at the farm, but we really could have stayed all day if we had the time. We all really loved the experience. What a great way to spend a day this Fall! The Fall Festival and Corn Maze will be open Saturdays 10 a.m. – 10 pm. and Sundays 10 a.m. – 5 p.m. through Nov. 9, 2014. General admission is $8 for ages 3-10 and $11 for ages 11 and up and includes entry into the corn maze. An Adventure Pass can be purchased for an additional $5 and includes unlimited access to the jumping pillow and train. Children ages 2 and under are free. SAVE $1 by ordering tickets in advance here.